Wild rice gourmet burgers are so easy and so good. We were looking through some of our meatloaf recipes to get ideas for new burgers, and wild rice jumped out at me. The burgers are tender, juicy, nutty, and flavorful. We always cook our burgers to well done, so it's important to have something else in the hamburger so the finished burger is moist and juicy. Bread crumbs or cracker crumbs are used most often for this purpose, but wild rice adds a wonderful flavor and texture. When you make burgers, be sure that you handle the meat gently. If ground beef is worked too much, the burgers will be tough. And always cook ground beef and other ground meats to a minimum temperature of 160 F, as tested with a food thermometer. The luscious potato salad in the picture is My Mother's Potato Salad. 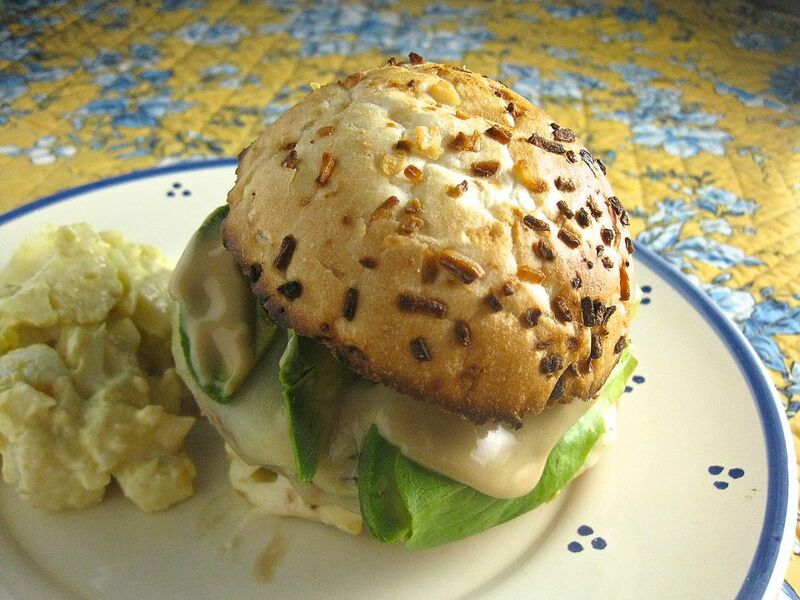 That salad is a great choice for an accompaniment to this burger; also try coleslaw or a bright fruit salad. Prepare and preheat a gas or charcoal grill. In a medium bowl, combine the ground beef, wild rice, honey mustard, and salt and pepper to taste; mix thoroughly but gently. Form the beef mixture into four patties and place on a plate. Press a dimple into the center of each burger so the burger stays flat when it's grilled. Grill the burgers over medium coals for 5 to 8 minutes per side, turning once, until a meat thermometer registers 160 F.
Remove the burgers from grill, put on a clean plate, top with cheese, and cover; let stand for 5 minutes to let cheese melt. Assemble the burgers with the lettuce, mustard, mayonnaise, ketchup, avocado, and burgers on toasted buns. Serve immediately.